Texas A&M freshman Patrick Kypson is a talented men’s tennis player—he’s among the top 100 performers in the sport on the sixth-ranked team in the nation. He’s also the goober you see hocking a juicy loogie into his own hand in the above photo. Last Friday, the Aggies made the trip to Columbus, Ohio to face off against No. 2 Ohio State in a match that would turn out to be one of the best seen so far this season; the two top-10 programs both put on excellent performances, with the Buckeyes edging out Texas A&M 4-3 when it was all said and done. Kypson, the one-seed for the Aggies, took on his Ohio State counterpart in freshman J.J. Wolf, who entered the match ranked No. 44 in singles play. The clash was a rematch of the 2017 USTA Boys 18s National Championships finals in Kalamazoo, Mich., in which Kypson downed Wolf 6-4, 1-6, 6-3, 6-2. On Friday, though, Wolf got the better of his fellow freshman, beating Kypson in three sets, 3-6, 6-3, 6-4. The story isn’t the defeat, here—both are talented young college players that will likely be the anchor of their programs in the coming three-plus years and accrue a number of victories over top-100 opponents. No, the story comes after match, when Kypson, who was processing his first defeat at the collegiate level, acted like someone who was feeling the sting of defeat for the first time in their existence on this planet. In a video posted online, after Kypson’s final return flew long, Wolf raised his hand to celebrate the victory with an excited group of Buckeyes fans in the stands. As the Ohio State player approaches the net, Kypson can be seen spitting, or pretending to spit, in his hand and offering it out to his opponent. Wolf, noticing at the last second, ducked his hand under Kypson’s and headed to the umpire. It’s unclear whether Kypson was punished internally for his apparent actions; while the team news page has not been updated to reflect any announced suspensions, the rookie did not appear in Sunday’s match against No. 24 Texas Tech (the Aggies did just fine, winning 4-3). 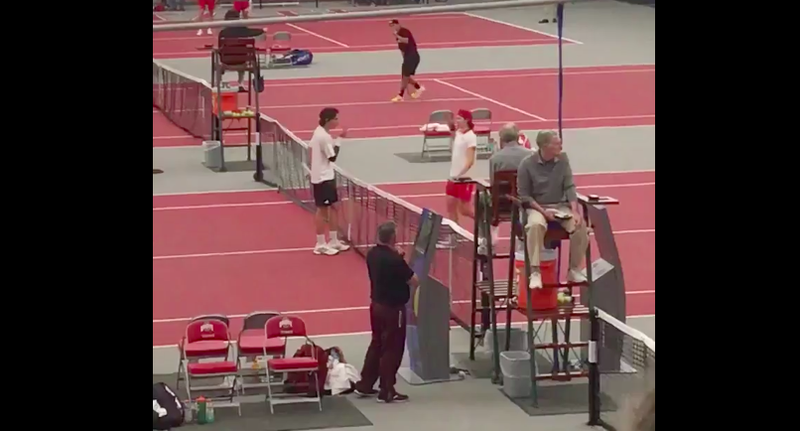 Deadspin reached out to the spokesperson for Texas A&M men’s tennis, inquiring if the program or athletic department had any comment on the video and if Kypson was suspended for the match against the Red Raiders. They did not respond in time for publication; if they do get back to us, we will update this post with their response. What Does Pizzagate Truther Tennys Sandgren Find "Interesting" About The Alt-Right?